20 Times Square, aka 701 Seventh Avenue, is almost complete. The tower already has one of the largest LED screens in Times Square, spanning a whopping 18,000 square feet. In February, doors will officially open to the 517-foot, 42-story, 452-key Marriott Edition hotel, wrapped in glass panels and topped with the logo on its western and southern facades. Witkoff, Ian Schrager Company, Winthrop Realty Trust, and Maefield Development are the developers, while Platt Byard Dovell White Architects (PBDW Architects) is the project’s architect. The new Marriott Edition Hotel coming to 701 Seventh Avenue, in Times Square, is approaching its opening day, with glass now covering most of the exterior per the latest photos from Tectonic. While the tower portion of the development stands 42 floors and 512 feet to the rooftop, barely cracking into the mid-levels of the Midtown skyscraper plateau, the base of the development will imminently become iconic on a global level, thanks to an 18,000 square-foot LED screen that promises to become the largest and brightest in Times Square. Vertical construction is moving full steam ahead on the 42-story, 452-key EDITION hotel (by Marriott) under development at 701 Seventh Avenue. That’s on the corner of West 47th Street in the heart of Times Square. The progress can be seen thanks to a photo posted to the YIMBY Forums. The tower, dubbed 20 Times Square, will rise 517 feet above street level and will contain 269,769 square feet of commercial space, according to the latest building permits. Retail space will be located on two cellar levels and the ground through fourth floors. Actual hotel rooms will be located on the 14th through 40th floors. The year 2015 marked the near-complete demolition of Times Square’s second oldest structure. The Columbia Amusement Co. Building, which opened at Times Square’s northeast corner on West 47th Street in January 1910. 701 7th Avenue was known by a variety of names during its century-long life span. 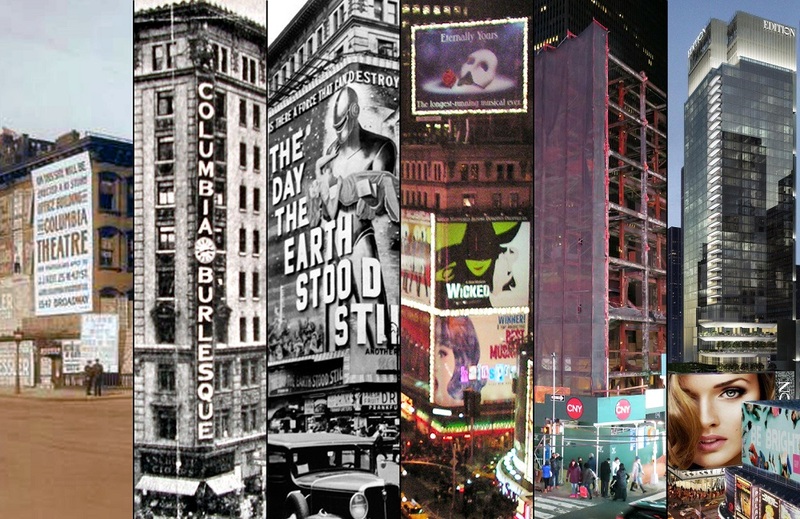 Like the slightly older yet much more famous One Times Square at the opposite end of the square, the building engaged in the neighborhood’s classic disappearing act, where giant billboards seen by millions made their renovation-scarred hosts all but invisible. But behind the ads, standing on a 16,000-square-foot lot, was a building with a history as dramatic and diverse as that of the famous square on which it stood. Back in October of 2012, YIMBY broke news of plans for a significant hotel and retail tower at 701 Seventh Avenue, in Times Square, and now that excavation is nearly complete, foundation work is imminent on the 39-story, 452-key Marriott Edition, according to the New York Post. Dubbed 20 Times Square, the building will measure just under 270,000 square feet and will include 76,000 square feet of retail space. The retail base will also feature an 18,000 square-foot LED sign. Steven Witkoff, Ian Schrager, Winthrop Realty Trust, and Maefield Development are the developers, while PBDW Architects is designing. Completion is expected in 2017.